In the implementation process of an enterprise's sales policy, it is often subject to the dealers' resistance and opposition. Sales personnel are caught between the company and the dealer. If one party handles it improperly, it will leave hidden dangers for their own work. How to establish a bridge of communication between distribution companies and enterprises, to ensure the implementation of the company's various sales policies, but also eliminate the dealer's doubts and dissatisfaction. This will test the sales staff's coordination and communication skills. There are three main reasons why it is difficult to communicate with customers: First, customers have strong self-esteem, have their own opinions on product sales, and are in conflict with the company's sales policies. Second, when companies formulate sales policies, they do not fully consider the particularities of individual markets and there is a problem of enforcement. Third, sales staff and dealers usually lack of communication. Deviations occur and the responsibility is attributed to the dealer. 1. For difficult customers, more communication is needed. Only with more communication can we strengthen mutual understanding. The self-conscious customer is not unwilling to communicate, but he is accustomed to his own habit of thinking, and it is difficult to accept the opinions of others. Only when you respect the other person's point of view can you guide his thinking to the company's business principles. You can ask yourself, "What do you do if you are the boss of our company?" 2, to learn to empathy. From the dealer's point of view to think about the problem. The common interests between distributors and enterprises are merely the contradiction between short-term interests and long-term interests. Communication with distributors should take care of the length of the benefits. 3. Regarding the characteristics of the market, there is indeed a mismatch between the company's sales policy and the market, and the company's policies may be adjusted appropriately. As long as it is conducive to product sales and market construction, you can get company support and dealer understanding. 4, there is a straight heart. Do the same to customers. Do not determine the level of your management efforts based on the distance between your customers and your relationship. Only fairness and fairness can establish your prestige. 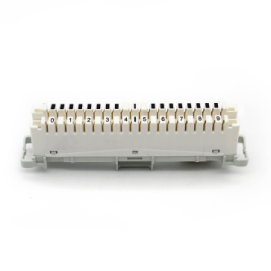 Dowell Group supply LSA-Plus Series Product including 8/10/20 pair Connection module, Disconnection Module , NT module and Highband Module. with good quality and competitive price, 100% test in the workshop before send to our customer. LSA-Plus Disconnection Module: Contacts on the front for measuring and testing in both directions, disconnection modules have two piece contacts normally closed, incorporating a disconnection facility, this gives all the features as above plus the added advantage of individual pair disconnection and four wire test access. 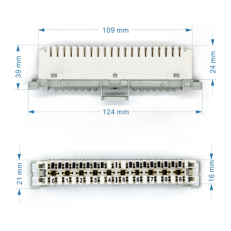 LSA-Plus Connection Module: Parallel tap on front measuring and testing connection modules have a one piece contact providing a continuous link between permanent wiring and jumper wiring, giving provision for monitoring access and over voltage. LSA-IDC Switching Module: Normally opened, the line normally connected by protecting elements. Colour normally Grey base & Crimson body, or to be ordered. 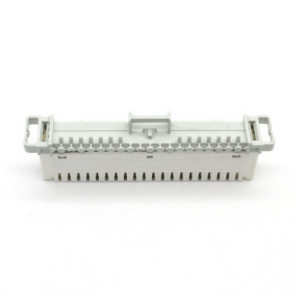 LSA-IDC Earth Module: earth module for connection drain wires to an earth contact without soldering, wire stripping or the use of screws.